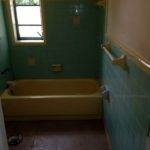 Tile Resurfacing | The Resurfacing Doctor, Inc.
Are the tiles in your home or office chipped, cracked or faded? No matter the location, old tiles are a quick way to lower the value of your home or office. The Resurfacing Doctor’s team are experts in tile resurfacing and tile refinishing serving all of Palm Beach, Dade and Broward County! Our tile resurfacing process involves preparing the tile’s surface so that any chips, scratches or rough patches are smoothed out. This allows the newly applied compounds to better adhere to the surface. 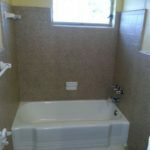 Many of our clients in the West Palm Beach, FL area have tried a do it yourself shower refinishing kit. Many have found that they simply don’t have the proper tools needed to get the end result looking as good as new. A common issue DIY goers face is having a small gap between the drain and where the tub’s surface meets. This can lead to the finish peeling and stripping away from the surface. 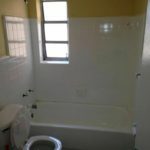 Residues in the bathtub that are not properly removed can also be of concern. The new shower resurfacing compounds will not create the bond needed to ensure the longevity desired for the project. Furthermore, most people don’t understand that once these do it yourself compounds are applied, the cost of removing them again can be very costly. Applying them properly by a professional the first tame will save you money in the long run. 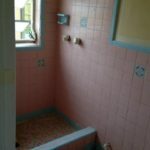 Completely replacing your bathroom or kitchen tiles are typically a last resort for most home owners. Major reason is you’re guaranteed days of inconvenience, ceramic dust, and grout streaks that are very hard to clean. Why sign up for all this trouble when you can simply RESURFACE it? Resurfacing your homes bathroom fixtures, bathtub, kitchen counters, tile instead of replacing them is a far quicker, less invasive, more economical way to breathe new life into your living spaces! Give us a call today for a free Tile Resurfacing estimate today!